In 2000, Roxanne Wilde (Kim Wilde's sister), Morgan Quaintance, Joe Holweger and Tom Hanna signed to Polydor records as Dimestars. 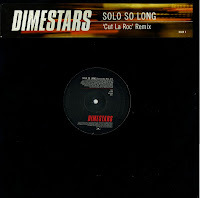 They tried to forge a career for themselves, starting off with the single 'Solo so long'. It was released as a cd-single and cassette single, and this 12" single, the only vinyl release by Dimestars as far as I know. 'Solo so long' did not chart. The follow-up single 'My superstar', released in 2001, did. Their album 'Living for the weekend' was pressed and distributed as a promotional disc, but never got a commercial release in the end. Dimestars toured with Kylie Minogue in 2001, but split up after their career didn't take off. Right now, Roxanne Wilde is one of Kylie's backing singers during her current world tour.